A beautifully finished contemporary villa with pool, internal courtyard and stunning panoramas. With its internal courtyard garden with pool, Camelia's design has something of the traditional Sicilian baglio or Moroccan riad about it. Here, however, inward-facing privacy is perfectly balanced by large external windows and wrap-around gardens offering splendid vistas of Mount Etna and the Ionian Sea. ⁴ guests staying at Camelia have privileged, reduced-rate access to Belmond Villa Sant'Andrea's exclusive lido on the beach at Mazzarò. Inside: accommodation at Camelia is arranged on one floor that wraps around an internal courtyard. Half of the quad are given over to living and reception areas which flow organically into one another. At the front, making the most of the floor-to-ceiling windows that offer both access to the surrounding gardens and views down to the Ionian coast and the sea, is the main living area. A parallel wall of windows looks into and accesses the internal courtyard and pool. An elegant day bed, a series of comfy sofas and divans, a large bookcase and an eclectic range of art and objets d'art populate this light, airy and generously proportioned space, providing splashes of colour and elegance. Moving along, past the internal dining area, one comes to the well-equipped kitchen with central island and direct access to the al fresco dining area. Just off the kitchen is a double bedroom with en-suite shower room. The bedroom looks onto the pool and internal courtyard, while the shower room accesses the surrounding grounds. The other two bedrooms, a double-twin and a double, are accessed from the living area. The double looks out onto the pool and internal courtyard and boasts an en-suite bathroom with tub, shower and a glass door leading out into the gardens. The double-twin opens onto the gardens and has an en-suite shower room. All the bedrooms are spacious, elegantly fitted and furnished and come with walk-in wardrobes. Outside: central (in all senses of the word) to the al fresco living experience at Camelia is the cosy internal courtyard, accessed from the living area. Home to a lawned garden, a refreshing pool and a palm tree, this most private of gardens offers an ideal mix of natural shade and sun for most of the day. Immediately surrounding Camelia is a mix of lawn, flourishing Mediterranean shrubs and flowers, citrus orchards, a children's play area, and low lava stone walls. 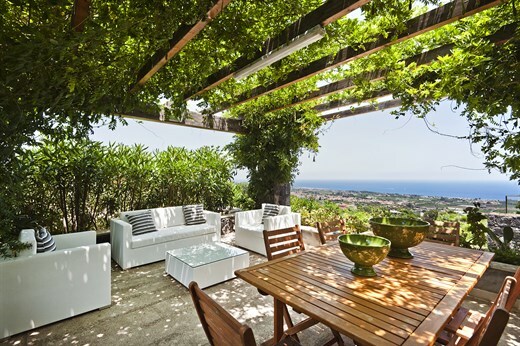 The east-facing area of garden, accessed from the living room, offers 180-degree vistas that takes in the Ionian Sea, the coastline up to Taormina and even Calabria on the Italian mainland. On the north side of the house, conveniently accessed from the kitchen, is a flower-strewn pergola, where you will take most of your meals. Served by a barbecue and offering superb views out to sea and up the Ionian coast, you will certainly look forward to long lazy dinners here at the end of the day. Views from other parts of the grounds take in the surrounding orange orchards and the majestic peak of Mount Etna rising up in the west. The large citrus estate surrounding Camelia is home to another of our villas, Ortensia, which is located around 120m away. Owned by members of the same family, the villas share part of the access road but each enjoys total privacy. If you're travelling in a large group or with another family, why not take both of them? Guests staying at Camelia have privileged, reduced-rate access to Belmond Villa Sant'Andrea's exclusive lido on the beach at Mazzarò. There is a drop from one side of the outdoor dining pergola, so we recommend younger children are supervised when in this area. Camelia's position on the lower flanks of Mount Etna affords it refreshing breezes in the hot summer months and excellent views of the sea and Mount Etna all year round. By dint of the property's elevated position, traffic noise is audible in the grounds, though not from inside. Situated in a panoramic position above the town of Giarre on the east coast of Sicily, about half way between Catania and Taormina, Camelia is an excellent base from which to discover the area's historic towns, Mount Etna and the fascinating villages that populate its flanks. There are some lovely beaches down on the coast below, including those at Fiumefreddo and Marina di Cottone, which have received several consecutive "Bandiere Blu", attesting to the cleanliness of the water and their general ecological excellence. The chic lidos and evocative beaches below Taormina are just up the motorway, while an 18-hole golf course is 45 minutes' drive away. "Camelia was stunning. The staff were incredibly kind and helpful. I would happily use your services for anywhere in the world! I wish you serviced other countries and continents. It's so hard to find trusted accommodation." Camelia was superb in every respect. The owner was most helpful and the maid efficient and friendly. Camelia was great and it was a pleasure to stay there. Camelia was amazing and the view was spectacular. The kitchen was very well equipped which made cooking in the house a true pleasure. My family and I have travelled in Italy for many years now and used a number of different villa rental companies. The Thinking Traveller rates above all other companies. Every detail is thought of, everything works, houses and locations are always unique. In short, it’s the perfect company to book a holiday through and we’ll certainly do just that again many times in the future. Camelia was stunning. The staff were incredibly kind and helpful. I would happily use your services for anywhere in the world! I wish you serviced other countries and continents. It's so hard to find trusted accommodation. Camelia was beautiful, clean and met all our expectations. The maid who came every morning to the villa set our breakfast out so beautifully and this felt like a real treat. We thank you for making our visit to Sicily so efficient with your amazing staff and information packs. Camelia was amazing and our contact with the owner was great (very gracious and helpful). I am not one for exaggeration and I am not exaggerating, but the quality, settings, views, etc were just totally spectacular. It was very clean and super well maintained. You rate off the wall with me because of the accuracy of the description, the attention to detail, and that you provided us with excellent support. I am speaking for all of us when I would highly recommend you to anyone seeking your services. Our holiday was great. Camelia was extremely nice and well-equipped. We lacked for nothing. The only problem was that we never wanted to leave to do the touristy things! Camelia is a beautiful home. The owner is terrific. She was so helpful and quick to respond to our questions, including local fish markets. The standard of Camelia was excellent. Everything we needed and more was available. A lot of attention to detail by the owners made for a very relaxing and luxurious holiday. Lovely owners. Very helpful and the villa had more than we had expected. The housekeeping service was excellent. Nothing could be added to increase our enjoyment. Camelia is a very elegant modern villa with outstanding views that take your breath away. A peaceful spot to relax surrounded by luxurious amenities. Camelia is such a comfortable and graceful property ideal for any group combination. The open view was to die for! A dream kitchen for cooks which is expertly equipped and everything is designed with great taste and with comfort in mind. We loved Camelia and being close to Mount Etna and the sea. The presence of the maid was an exceptional treat. Camelia was excellent. I appreciated how well kept the property grounds and pool were. The house itself was very clean. I also appreciated the decor as much as the views! The housekeeper was an incredible bonus! Camelia is a beautiful house. In villa cook was very good and it was so nice to have someone prepare a meal in the villa after we had traveled for about four hours by car to get there. The appointments, equipment, etc. were excellent. The villa was spectacular - an architectural jewel overlooking the Ionian and Mt. Etna. Beautiful gardens full of indigenous plants and flowers and orchards overflowing with olives, citrus fruits. How could it be better? . ): Our in-villa cook was fabulous. We asked for a typical Sicilian meal and we received more than we had hoped -- first course (arancini), followed by pasta, then baked orate (fish) and a fabulous tiramisu for dessert. We loved the experience of coming home after a hard day of tourism, and finding a great meal awaiting. We enjoyed our stay at Camilla in August 2015. The villa is very comfortable and clean. It is tastfully designed to make you feel like at home! The host welcomed us on the first day and gave us detailed instructions about the villa and places around. Location is great, very close to Taormina and Etna. I highly recomend this villa for family vacation or just romantic stay! The housekeeper was fantastic and extremely caring and helpful. We loved having breakfast made for us! The villa was outstanding. Tagliaborsa, the little town we were near, was a very comfortable, hospitable place to live for the week.